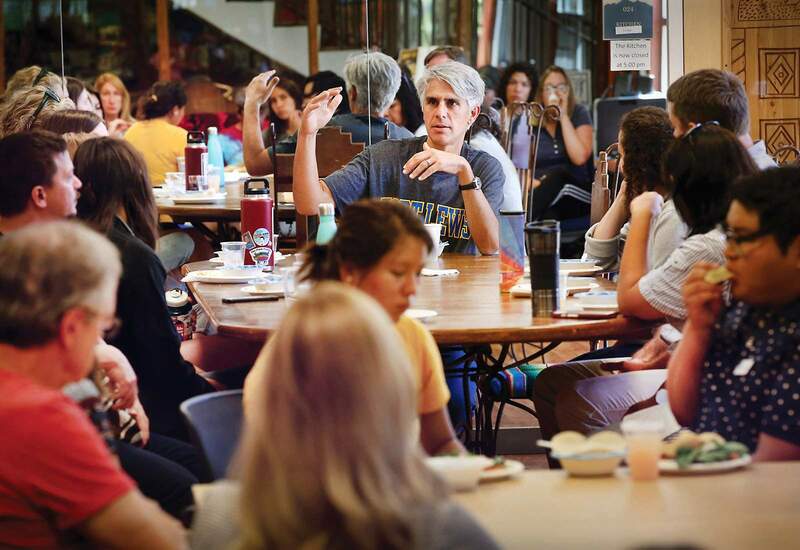 Fort Lewis College President Tom Stritikus meets with students, faculty and staff during a “Chit Chat” on Friday at El Centro de Muchos Colores in the Student Union at the college. Stritikus has been on the job for about five weeks. He has spent most of that time listening and seeking feedback from those on campus. 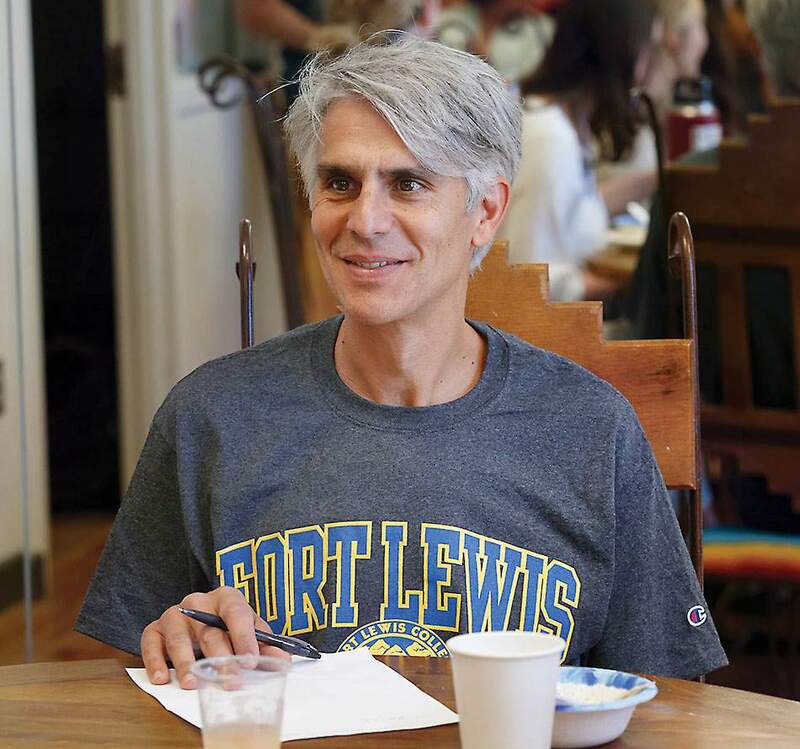 Tom Stritikus is beginning his tenure as president of Fort Lewis College playing to a strength: listening. Stritikus is in the middle of a listening tour during his first weeks on campus. He credits four years at the Bill & Melinda Gates Foundation with helping him become a better listener. “At the Gates Foundation, we weren’t doing the work. We were helping people do the work with funding. I learned to ask questions about what people are capable of doing, and working to figure out how we could help them,” he said. His all-ears modus operandi appears to be a practiced discipline; even as a candidate for the position as president, he first sought feedback from an audience at public meet-and-greets before he fielded questions from gathered students, faculty and staff members. Stritikus said he is not focused on looking back after FLC went through more than $4 million in budget cuts for the current academic year. But he credits the work of the staff, faculty and former President Dene Thomas with what, at least at this moment, appears to be a reversal of nine years of declining enrollment that led to the budget cuts. Unofficial enrollment is pegged at 3,278 students for fall 2018, an increase of 242 students from the college’s projections. Official enrollment numbers are made on the 11th day of the fall semester. “It came from a lot of hard work from recruitment and admissions and people reaching out to make school visits. We had faculty members calling prospective parents,” Stritikus said. He said the school has revamped its visitors program and the kind of experience potential students and their families have when they visit FLC. The campus nestled in the San Juan Mountains and the work being done to keep it in top shape will continue to be a great aid, he said, and the more visitors the school can bring in, the better. “When people see the campus, it sells itself,” he said. One move Stritikus has taken incorporates the school’s setting and its core mission. It now has a new motto: The crossroads of education and adventure. “We have a lot to celebrate and market here,” he said. 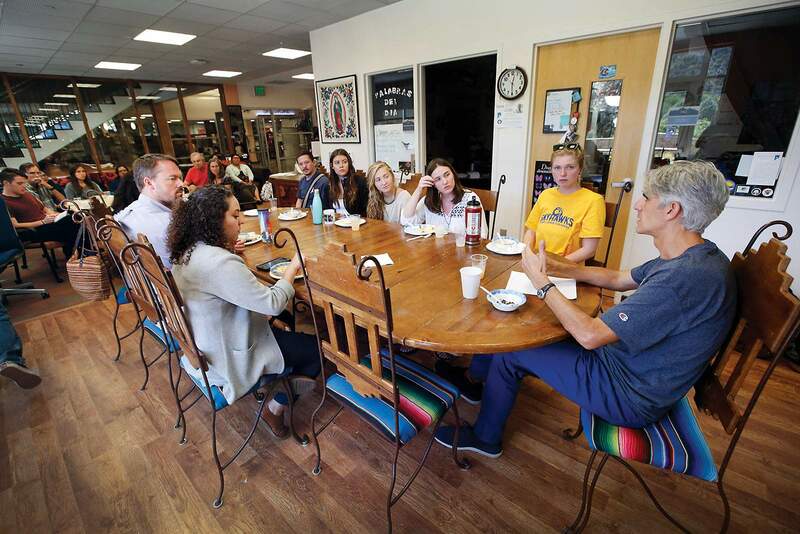 Fort Lewis College President Tom Stritikus meets with students, faculty and staff during a “Chit Chat” on Friday at El Centro de Muchos Colores in the Student Union. Addressing declining enrollment will be an early challenge Stritikus must tackle. At new student orientation last month, he talked with parents of an Oklahoma student who were stunned by the beauty of the campus. Stritikus said his first three weeks at FLC and the efforts made to reverse the enrollment declines showed him that the school has a great faculty. Now, with students back on campus, Stritikus said he is revitalized and re-energized to pursue the school’s mission to provide them the skills and knowledge necessary to thrive when they leave Durango. The budget, which is looking better, he notes, is not “out of the woods” yet, but he also sees the budget as a tool, not the core function of a college. “First and foremost, we care about student success. We’ll take a look at budget decisions through that lens,” he said. “A leader has to be in touch with the culture, and ensure people feel valued and trusted to be their most effective selves at work,” he said. A debate on many campuses about tension between a competition for resources by liberal arts and science, technology and engineering strikes Stritikus as a false dichotomy. The school ultimately needs to be relevant to the community, he said. “A school should look at the programs that students want to do and what the needs of the community are,” he said. Vicki Phillips, who hired Stritikus at the Gates Foundation, said she was impressed that the College of Education at University of Washington, where Stritikus served as dean, was a hands-on institution and active out in the community. “They were out in schools doing innovative things and helping teachers directly,” she said. It was no accident Stritikus sought out an institution that has a tuition waiver for Native American students, she said. “He was deliberate in looking for a spot where he could forward a mission of equity,” she said. Tom Stritikus, Fort Lewis College’s new president, came to the school after serving as deputy director of education at the Bill & Melinda Gates Foundation. He also served as dean of the University of Washington College of Education, which he led through a budget crisis. Under his direction, the College of Education’s annual budget grew from $48 million to $84 million. Stritikus is a first-generation college graduate, earning a bachelor’s degree in English from the University of Nebraska-Lincoln in 1993. He holds a doctorate in Education in Language, Literacy and Culture from the University of California-Berkeley.